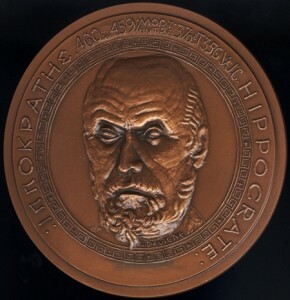 The portrait medal of Hippocrates (copper, 95 mm) was designed by Jacques Devigne for the Paris Mint in 1983. It is Sonnenschein #0650 in the Ralph R. and Patricia N. Sonnenschein Collection of Medical and Scientific Portrait and Commemorative Medals. On Friday, May 31st, students of the David Geffen School of Medicine Class of 2013 received their degrees and hoods, after which Dean/Vice Chancellor A. Eugene Washington administered the Hippocratic Oath. But which “Hippocratic Oath?” The pledge to practice medicine conscientiously and honorably comes in many varieties. The current UCLA oath was adapted by now-Dean Emeritus Sherman Mellinkoff and differs significantly from the version recited by the first graduating class in 1955, for example. A mini-exhibit by History & Special Collections for the Sciences, in the Biomedical Library (1st floor, in the lobby), includes six-century old texts, commencement programs, an academic medical badge presented by Nicholas II of Russia to a new doctor in 1915, portrait medals, and a leaf from “the” Hippocratic tree at Kos, to briefly illustrate the history of the Hippocratic Oaths … plural. The Hippocratic Oaths … Plural (Six Centuries of Texts, Six Decades of Commencements) is on view through June 23rd.